These words appear on every job application. Everyone always tells you to make sure that your resume stands out against the other candidates. How am I supposed to make sure that mine is different from all the rest? What are the important things that I need to include on it? These are all questions that come to mind when writing a resume. I have read plenty of articles giving me all sorts of resume tips. I have been in classes where creating a resume was an assignment. How was I going to make sure that mine stood out? I start from the top. Name, contact information, and education. Your name is important, so I make mine a little bit of a bigger font than the rest of my resume. I include my address, phone number, and email so that when the employer reads my amazing resume they knew how to get ahold of me. I put my school name, my major, expected graduation date, so the employer knows that I have the education background for the job that I want. This section wasn’t too bad. In the related work section I make sure that I bold all of my position titles, places of employment, and the dates that I was there. This way, when the employer is scanning my resume they can quickly see the titles and then read on if they are interested. In the sub-points for each job, I describe what I did, always starting with a verb (this website has a great list of verbs that make your resume more powerful https://www.themuse.com/advice/185-powerful-verbs-that-will-make-your-resume-awesome.) If I currently hold the position, the verb is in the present tense, if it was a past position, the verb was in the past tense. I put my experience in chronological order. You can choose to do it this way or you can order the positions by relevancy. Throughout college I have been involved in many different student organizations. My resume was a perfect place to show all of the relevant skills and experiences I have gained through those. This section is formatted just like the related experience section except instead of them being employment related, they are leadership and professional organization related. The final step in my journey to make my resume one that would stand out to employers and land me that job is to get feedback. My family is happy to help, my friends are almost as happy, but I will have to read a couple of their resumes too. I will also take it to one of Career & Leaderships Resume Doctors so that I could get a more professional opinion on it as well. After talking with these different people I also got some advice on what not to put on my resume. The two most important pieces of advice I received was to make sure that I did not have any spelling, grammatical or punctuation errors on my resume and that my resume was not more than one page long. These mistakes could take me one step back in my goal to look professional. Another piece of advice was to make sure that I am using an easy to read format so that the employer could easily follow my experience and skills and relate them back to the job. Finally, they told me to make sure that I am highlighting that I have the required skills and experience for the job. I can do this by taking out experiences that aren’t as relevant and elaborating a little bit more on what was. A resume is never completed. With every new job and every new experience there is something to add. As time goes on there will be things that are no longer relevant. However, now after going through my resume and making sure that the basic layout is good, I feel a lot better about attaching my resume to the job application and sending it out to future employers. Note: It is not recommended to send out massive quantities of your resume unless it is tailored to each specific position. Career & Leadership Development is a great place to get your resume reviewed no matter what field you are in! Call (262) 472-1471 to make an appointment today! In present day, it seems like every entry level position out of college wants to see some sort of experience. This experience is usually gained through an internship. While the internship search can be daunting and challenging, there is a department on campus that offers great internships. As current interns for Career & Leadership Development, we spoke to other interns in the office to see how working here has not only given them job experience, but so much more. As you can see, there are many different facets of C&LD and each offers a different experience. Whether you are looking to be a social media guru, coordinate community service events, or just learn something new about UW-Whitewater and what it offers to students, C&LD is a great place to gain all these experiences and many more. The applications are open until March 3rd! If you are looking for an internship and want to be a part of the C&LD family, then go to uww.edu/cld and apply today! Interested in the Disney College Program? We’ve got you covered. Not sure how to navigate Hawk Jobs? We’re on it! Do you want to have an international internship? We have the resources! Career & Leadership Development can help you with these and so much more. I strongly encourage every college student to have a professional staff look over your resume before you submit it to the hiring manager of your dream job. Professional staff will see things you won’t, will notice little details that need to be added or taken away, and can provide great advice on formatting, layout, and style. The staff can also help you develop a cover letter and can give you advice on what to include, what to leave out, how to format it, and what kind of salutation would be appropriate. So, you know you need to have an internship under your belt before you graduate. That’s good! But, how do you go about finding one? The career counselors have many resources and websites to help you find an internship in the field you want to get into. They also know about many resources, online job boards, and about upcoming career fairs to help you find a job. Graduating seniors, it’s not too late to visit the career center and help you secure a job after you graduate! Being interviewed is a scary thing! But wouldn’t you rather be prepared for one than not? The career counselors are more than willing to perform mock interviews with you – in person, over the phone, over a meal, or even over Skype! Career counselors may meet with you in their office, or you can ask to do it in the Bailey Interview Center. Unsure about what you want to do after you graduate? Grad school, travel, or find a job?! Or, if you aren’t graduating for a few years, are you thinking of internships, involvement, or various career paths? We provide many career assessments to give you an idea of what career path might be best suited for you, during college and after you graduate. Career & Leadership Development not only deals with career-related things. We also want you to get involved before you graduate. Getting involved in organizations and taking leadership positions will greatly increase your chance of receiving a job offer! We encourage you to visit the Involvement Office, which is the room to the left of the Bailey Interview Center. Here you can find out about all the organizations on campus, about Greek life, and what kind of professional organizations you could join. The Connection Center, which is where WSG, LAU, and the Non-Trad Pad is located, is also a great way to get involved and to connect with organizations and students. See all the great things Career & Leadership Development has to offer?! We’d love to help you in any way possible. If you need help in one or more of these areas, don’t hesitate to make an appointment with one of the career counselors. That is what they’re here for! Simply call Career & Leadership Development at 262-472-1471 or visit us in the University Center, up the ramp/stairs across from Freshens. The staff in Career & Leadership Development are here to help you with your career-related needs. We can meet with you in person, have a conversation over the phone, or electronically. Feel free to schedule with us by calling our main office at (262) 472-1471, or by stopping by our office located in room 146 of the University Center. Career Exploration – Meet with a career counselor to talk about career paths that best align with your interests, values, and abilities. Career Information – Staff can assist with your research into various careers and industries, and talk about employment trends. Job Search Strategy – Discuss how to best organize and conduct your job or internship search. Learn to implement an effective process for finding a job, and about the resources we have online to help you with your search. Help with Internship and Job Search – Whether you’d like your resume reviewed or help preparing for your interview, we can help you with all aspects of your search. Developing Your Professional Network – Discuss how tactics such as informational interviewing can help you develop your professional network and help guide your job search. Social Media – Do you want to know more about how to use LinkedIn for your job search? Other forms of social media? Staff are willing to review your profile and discuss how to effectively use these tools. Advice About Accepting Offers – We’re here to offer advice on the “do’s” and “don’ts” when responding to employment offers. Transition Into Work Issues – Staff are available to help talk through strategies for successfully starting your job or internship. 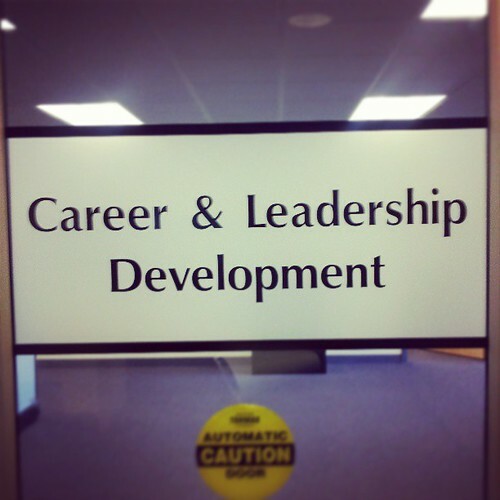 The Career & Leadership Development office is open from 8:00 a.m. until 5:00 p.m. Mondays through Thursdays, and 8:00 a.m. until 4:30 p.m. on Fridays. Self-Exploration Services – Meet with a career counselor to assess your interests, values, and abilities, and gain a better understanding of your career path. Career Information – Staff can assist with your research into various careers and employment trends. Job Search Strategy – Talk with a staff member about how to organize and conduct your job or internship search. Learn about how to follow an effective process for finding a job, and discover the resources we have online to help you with your search. Help with Internship and Job Search – Whether you would like your resume reviewed or help preparing for interviews, we can help you be prepared for your search. Social Media – Want to know more about how to use LinkedIn for your job search? Other forms of social media? Staff are willing to review your profile and discuss how to effectively use these tools. We’re available to meet with you in-person, on the phone, by using Skype, or via email. The Career & Leadership Development office is open from 8:00 a.m. until 4:30 p.m. Monday through Friday during the summer. The best way to schedule an appointment is by calling (262) 472-1471. Here’s just a quick reminder of the services we offer for career development. We are open 8-5p, Monday through Thursday, and 8-4:30p on Fridays. You can schedule appointments to meet with a career counselor by calling us at 262.472.1471 or stopping by our office in the University Center (Rm 146) across from Freshens. Check out Hawk Jobs to apply to internship and job postings, find a job on campus, and explore resources such as: Internships.com, Going Global, EmployOn, and Vault. You can also find lists of employers when career fairs are approaching. It’s FREE and all you need is your UWW username and password to login! You can “like” us on Facebook to find out about events, advice, and links to articles about what is happening out in the “real world” economy. You can follow us on Twitter through @UWWCareer and @uwwinternships to learn about the changing landscape of the world of work, office events, and jobs and internships from local employers. You can also ask us questions through Twitter!